Reminder Manager 3.0 for Microsoft® Outlook® 2007, Outlook 2010 and Outlook 2013 32-bit mode. 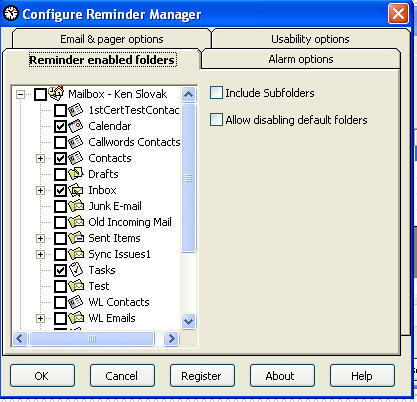 Reminder Manager 2.5 for Microsoft® Outlook® 2003 and earlier. German language version of Reminder Manager. Reminders from default and non-default PST files and Exchange mailboxes, Exchange public folders. Support for reminders from OLFolders and PublicShareFolder shared PST files. Send reminders to an email, pager or text messaging address. Flash a System Tray icon for reminders. Set default reminder snooze times. Manage all your reminders in one window. Selectable column display and printing, reminder grouping, print preview, printer style template. 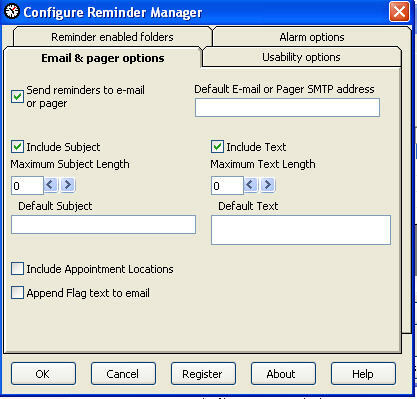 Reminders can be emailed to any pager or email enabled communications device. IMAP, HTTP and Business Contact Manager mail stores are not supported. Reminder Manager also provides an icon in the System Tray that is used to open the Reminder Manager window, configure Reminder Manager, and open other Reminder Manager screens. Reminder Manager 3.0 is a COM add-in for Outlook that supports Outlook 2007, 2010 and Outlook 2013. Reminder Manager 3.0.0 or later will work with Outlook 2007 and later in 32-bit mode. Reminder Manager does not work with Outlook 2010 or Outlook 2013 64-bit mode. Reminder Manager 3.0 does not work with Outlook 2003 or earlier. Reminder Manager 2.5 is a COM add-in for Outlook that supports Outlook 2003 and earlier. 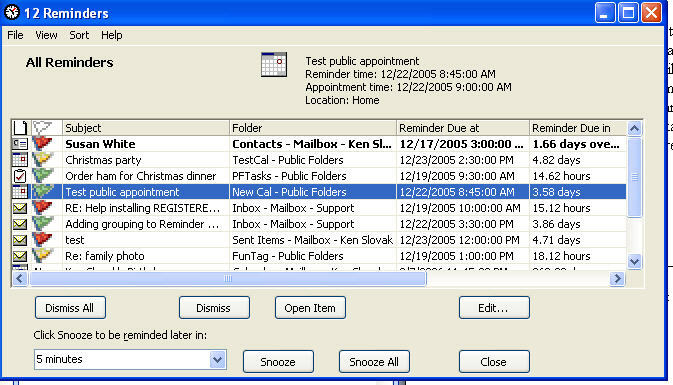 Reminder Manager 2.5 displays a unified reminders window even for Outlook 2000. Reminder Manager 2.5 is not intended for use with Outlook 2007 or later, and will not run on Windows 8. Reminder Manager provides a window that serves as your control center for all existing reminders. 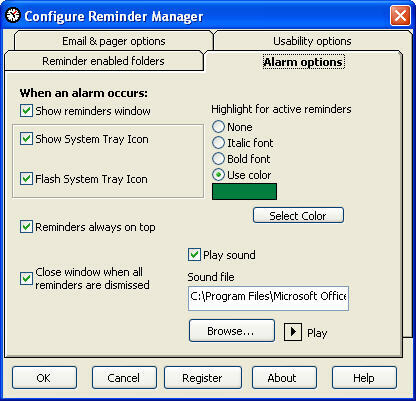 From the Reminder Manager window you can dismiss or snooze any existing reminder in any reminder enabled folder, open items with reminders and configure Reminder Manager among other options. 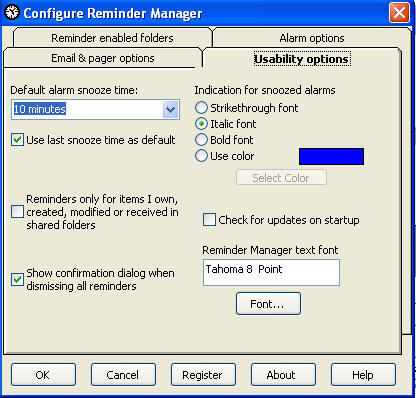 Reminder Manager now provides selectable column display selection, column order selection, reminder grouping and additional options for fonts, alarm and snooze highlighting. Reminder Manager is available in German. Aren't these the reminders you always wished Outlook could provide? Now Slovaktech has broken the reminders barrier and provided a tool that allows reminders to function the way you always wanted.